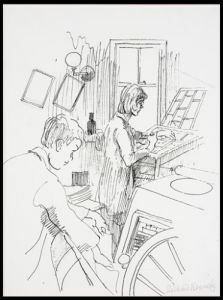 From the time of its inception in 1917 until Leonard Woolf sold the Hogarth Press in 1946, only 34 of the 525 Press publications were printed by hand. Smith College owns a dozen of the hand-printed titles. 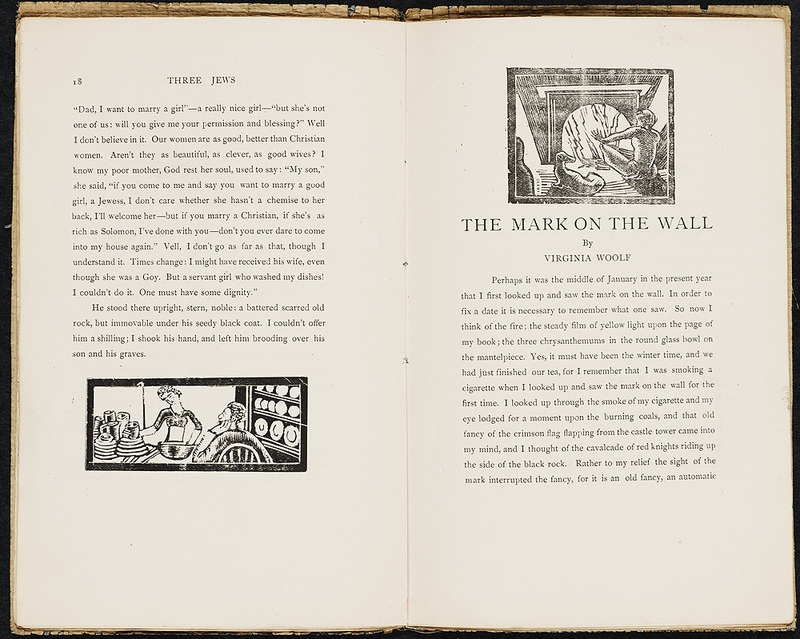 Printed and bound by Leonard and Virginia Woolf, they are fascinating examples of amateur bookmaking. 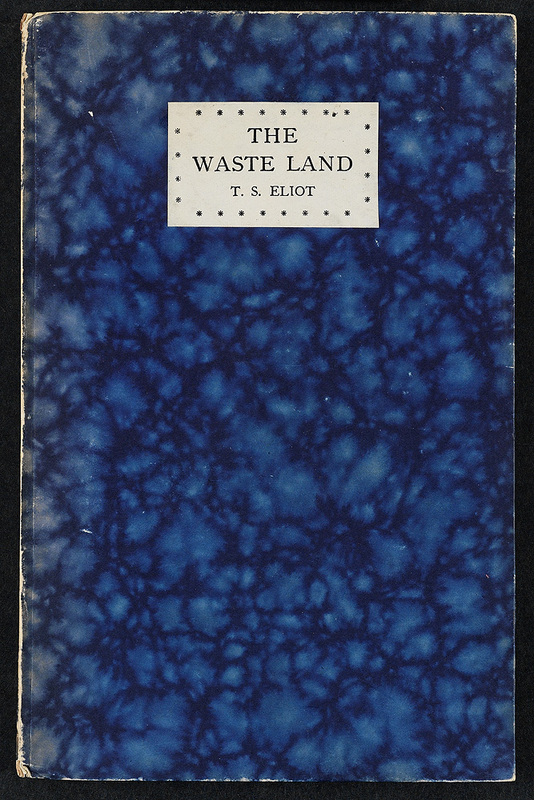 The Waste Land by T. S. Eliot is the iconic volume produced by the Hogarth Press and an emblem of high modernist verse. 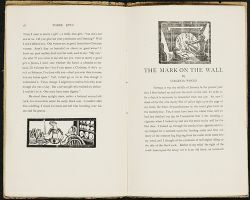 The illustrator Richard Kennedy worked at the Hogarth Press from 1928 to 1930. In one of his original drawings, Virginia Woolf is seen setting the type for Herbert Palmer’s poems. Kennedy feeds a platen press in the foreground. 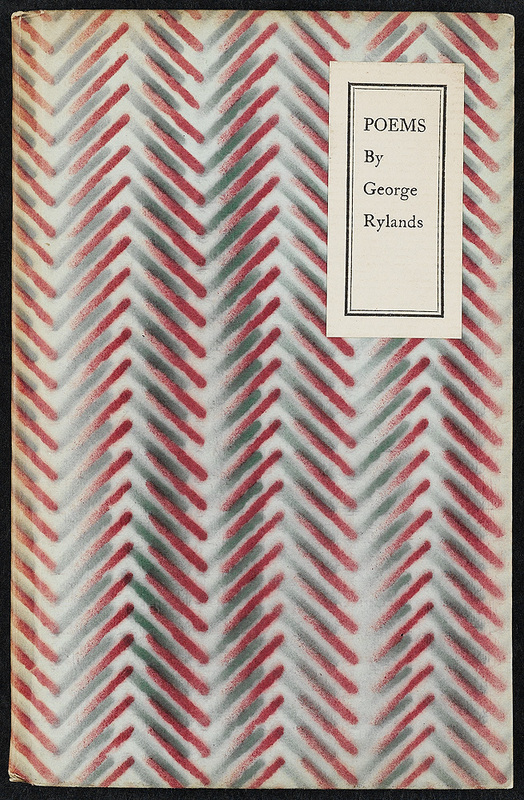 George (“Dadie”) Rylands, who was also an assistant at the Hogarth Press, published two volumes of poems, one of which is on display. 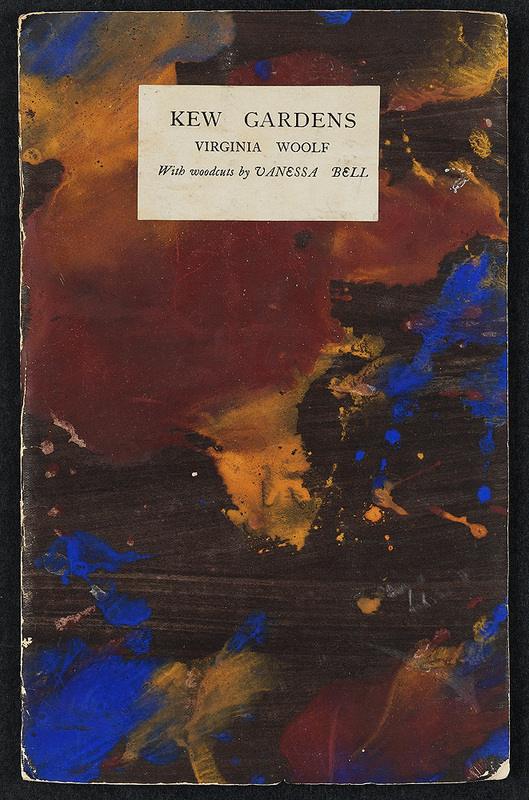 Setting type and binding books were therapeutic activities for Virginia Woolf. She was trained by bookbinder Sylvia Stebbing. T. S. Eliot. 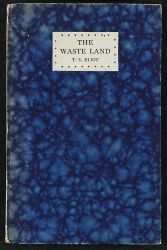 The Waste Land. Richmond: Hogarth Press, 1923. 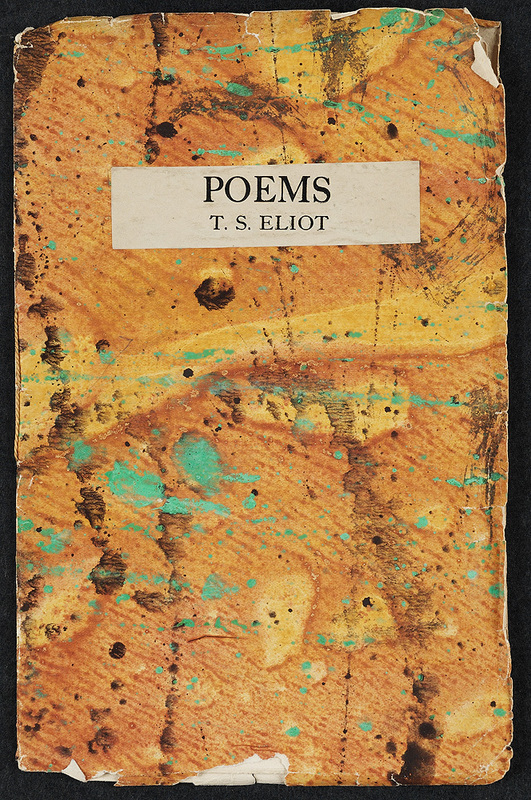 The first British edition of the poem with T. S. Eliot’s notes. One of 460 copies. Purchased. Richard Kennedy. Virginia Woolf Setting Type: ink and graphite drawing, n.d. 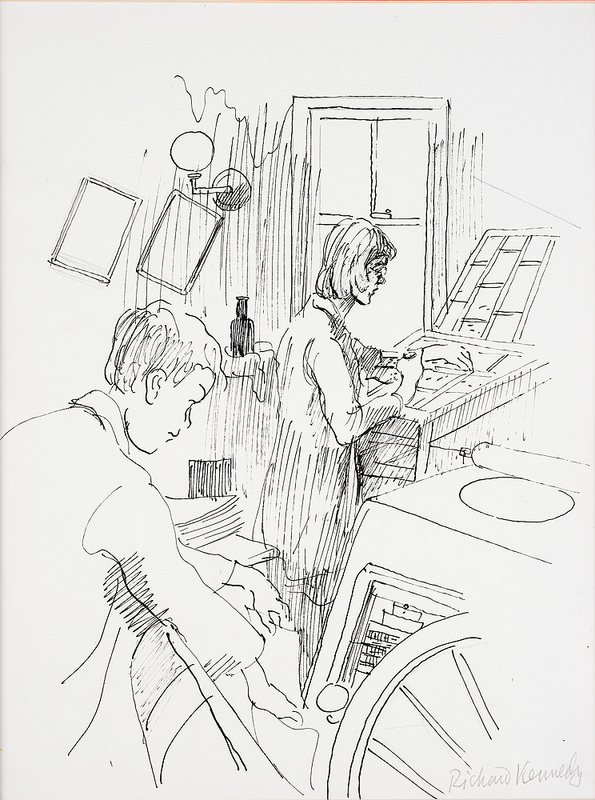 This was an illustration for Kennedy’s A Boy at the Hogarth Press (London, 1972). Presented by Elizabeth P. Richardson ’43. T. S. Eliot. Poems. Richmond: Hogarth Press, 1919. Inscribed from Logan Pearsall Smith to Princess Bibesco. One of 250 copies. Presented by Frances Hooper ’14. Virginia Woolf. Kew Gardens. Richmond: Hogarth Press, 1919. From the library of Lytton Strachey. 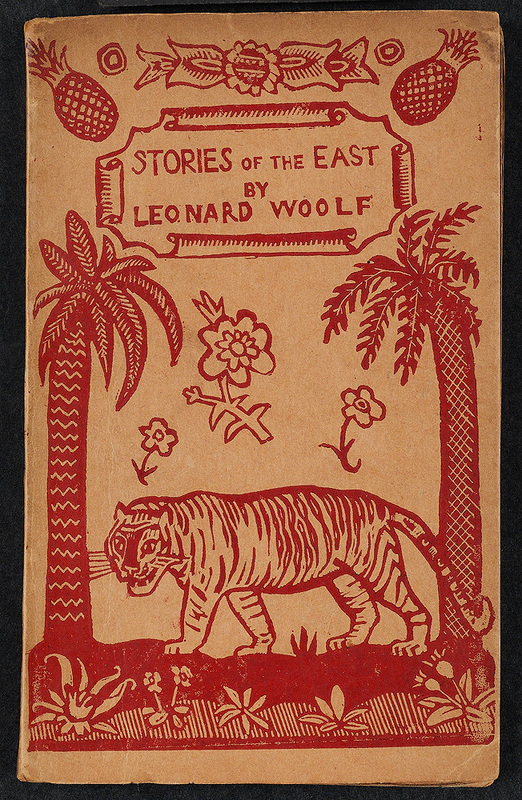 One of 150 copies, with cover hand-painted by Roger Fry and woodcuts by Vanessa Bell. Presented by Ann Safford Mandel ’53. Leonard Woolf. Stories of the East. Richmond: Hogarth Press, 1921. From the library of David Garnett. 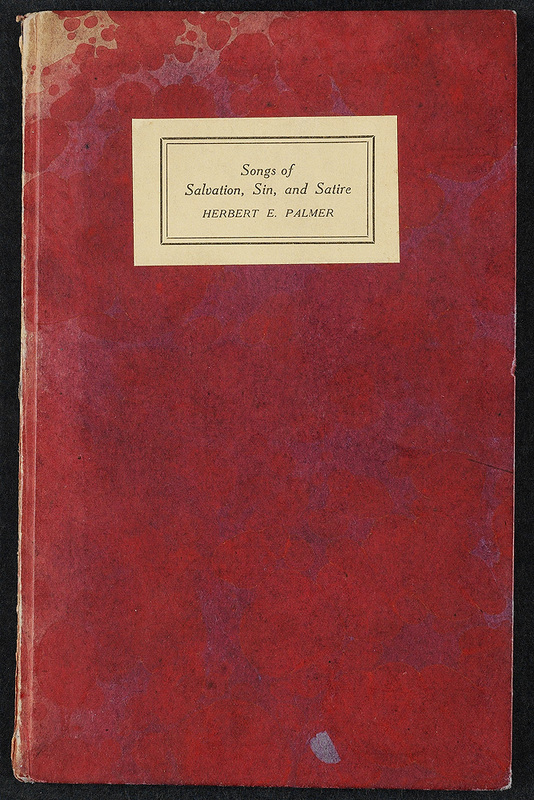 One of 300 copies, with cover design by Carrington. Presented by Elizabeth P. Richardson ’43. Herbert. E. Palmer. Songs of Salvation, Sin, and Satire. London: Hogarth Press, 1925. Corrected and inscribed by the author to Maurice Wollman. Dedicated to the ghosts of John Masefield and Siegfried Sassoon. One of 300 copies. Purchased. George Rylands. Poems. London: Hogarth Press, 1931. Copy number 169 of 350, signed by the author. Purchased. Virginia Woolf and Leonard Woolf. Two Stories. Richmond: Hogarth Press, 1917. With prospectus. Contains “Three Jews” by Leonard Woolf and “The Mark on the Wall” by Virginia Woolf. One of 150 copies, with woodcuts by Dora Carrington, bound in Japanese grass paper. Presented by Frances Hooper ’14.